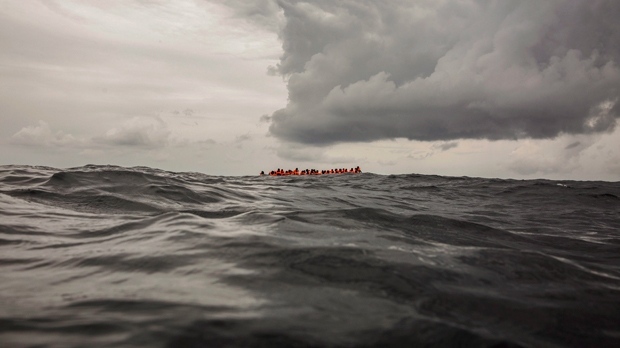 ROME -- Three survivors of a rubber dinghy that sank in the Mediterranean Sea off the coast of Libya say up to 117 other migrants were aboard at the time, a U.N. migration official said Saturday. Flavio Di Giacomo of the International Organization for Migration (IOM) told Italian state TV that “unfortunately about 120” migrants were reported by survivors to have been on the overloaded smugglers' dinghy when it was launched from Libyan shores on Thursday evening. “We cannot turn a blind eye to the high numbers of people dying on Europe's doorstep,” said U.N. High Commissioner for Refugees Filippo Grandi.